This gem is the creation of San Francisco-based Jeffers Design Group. I can't even begin to explain how much I love this bathroom...every bit of it. 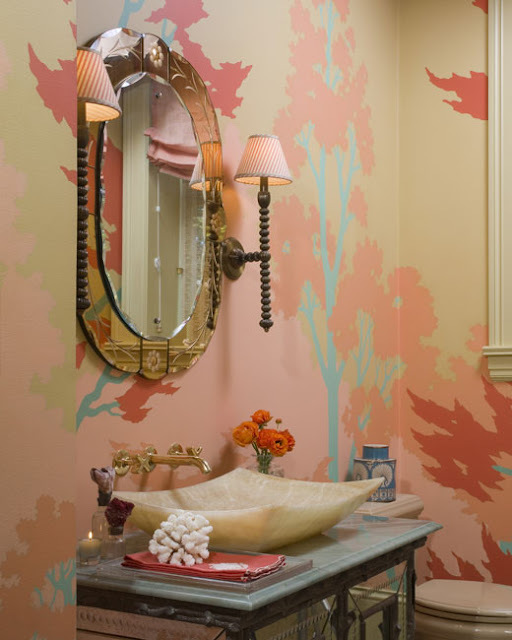 The wallpaper, the mirror and sconces, the color of the window trim, the brass faucet fixture...and that gorgeous little tea tin atop the commode. Brilliant. I am probably also incredibly drawn to this image because I am totally struggling with our own main-level bath...it's a stark white canvas (white tile, white walls) staring me in the face and I can't for the life of me decide what to do with it. Perhaps I'll pull some elements from this gorgeous example! Thanks for sharing it Averill! Yes, I saw her great post and I MUST find this wallpaper. I have mostly blue and gray in my house but have pops of cranberry in my living room and to a lesser extent, dining room. This is just perfect. I want to see it in person but it looks great on the screen! I just wanted to tell you that I went through your whole blog and absolutely loved it. I read like almost every posting. I have a blog as well but is mor fashion oriented as that is my background but I want to make it more about interior design as that is my new found passion, but is crazy since I have always been doing it just hit me that this is what I would love to do for the rest of my life. Thank you so much for sharing your wonderful postings....love love love...and especially knowing that you are a latina likes me brings more joy! Susie - that wallpaper is to-die-for. Would look amazing anywhere! You're welcome!! I love that one, too. JDG is absolutely one of the most talented firms I've come across. This is totally up my alley... I am completely smitten. Every detail is exquisite and the accessories are perfection. I'm all in!!!!!! I just found your blog through High Heel Foot in the Door. Love this bathroom. Off to check off some more of your blog! Daniella. love love this bath! It is gorgeous!